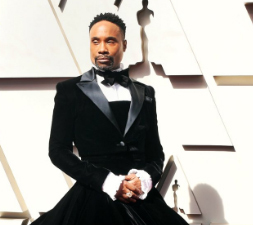 Actor Singer Billy Porter appeared on the red carpet in very unique and fabulous velvet tuxedo dress at Oscar 2019. Porter has twitted saying “When you come to the Oscars, you must dress up”. To make Porter’s appearance un forgetful and historic on red carpet Christian Siriano have designed such an amazing attire, styled by Sam Ratelle and groomed by Anna Bernabe. Porter was crowned best dressed of the night.